Table tents and pan bands! There’s never a better time than summer to fuel children’s imagination and give them free reign than summer holidays when they are unconstrained by time limits and school work. Encourage that imagination by creating scenarios and resources that they can build their games around right there at home. Kids love dens. They like hiding away and claiming little ‘kingdoms’ of their own. 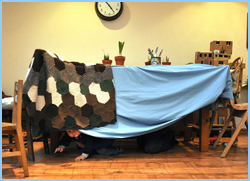 Dens can be created with the simplest household items – tables, chairs, clothes horses, washing lines, sheets, cardboard boxes etc. Help them build them in the garden or right there under the kitchen table. As well as the project of building the den itself why not encourage them to use it as part of their play eg use it as base for hide and seek or host a teddy bears’ picnic inside. This one depends on how tolerant you can be of noise (and possibly the neighbours too!) but kids love to make ‘music’. Get out your old pots and pans and wooden spoons and let them have a bash. Build in some arts and crafts and have them make their own shakers and percussion instruments. Why not put on a performance for dad (or mum!) when they get home from work. I’ve put lots of ideas on our Pinterest board for different sound making creations. Role playing is one of the most imaginative forms of play out there but some children struggle to take part or come up with ideas. Even the most creative ones can benefit from a few props and pointers. Help give their play some structure by coming up with a ‘role playing toolkit’: create a theme – pirates, princesses, fairies, space travel, exploration, invention etc – and create some resources with them such as making hats, tiaras, wings etc, putting costumes together or creating props like treasure chests, bags of fairy dust or ancient relics. That’s usually enough to get them started and they’ll take it from there but if they need a bit more assistance why not give them a number of challenges that they have to build into their adventure like finding a treasure map, appearing on TV or helping someone who is lost. Children’s imaginations often know no limits so a small nudge in the right direction is often enough to get them started. Invite a few friends round to make play even more fun as well as giving a fellow parent a bit of chill out time. You never know, you may get one back in return! There are lots more ideas for imaginative fun on our Pinterest board Summer Kitchen Activities for Kids. If you try any of these or have ideas for other creative play activities you can do at home then comment on here or join in the conversation on our Facebook page. If you comment on any of our summer activity Facebook posts, or add your own items to the Facebook page, you'll be entered into our free draw to win a £25 Toys R Us voucher! Next week we’ll be looking at arts and crafts so come back on Monday 11th August for more summer holiday ideas. 1 Response to "The Summer Kitchen Activity Guide Part 3: Creative and Imaginative Play"